OrbWeaver is an experiment by DARPA and Firmamentum, a division of Tethers Unlimited, Inc. (TUI) to evaluate technologies of in-orbit manufacturing. 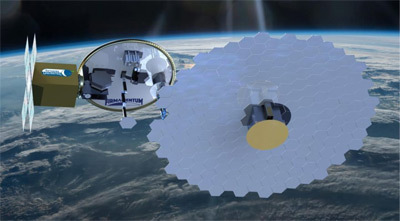 Under the OrbWeaver Direct-to-Phase-II Small Business Innovation Research (SBIR) effort, Firmamentum aims to combine its technologies for in-space recycling, in-space manufacturing, and robotic assembly to create a system that could launch as a secondary payload on an Evolved Expendable Launch Vehicle (EELV). This system would recycle a structural element of that rocket, known as an EELV Secondary Payload Adapter (ESPA) ring, by converting the ring’s aluminum material into a very large, high-precision antenna reflector. The OrbWeaver payload would then attach this large antenna to an array of TUI’s SWIFT software defined radios launched with the OrbWeaver payload to create a small satellite capable of delivering up to 12 gigabits per second of data to K-band very small aperture terminals (VSAT) on the ground. It is unclear, what the scope of the first demonstration mission is. The satellites were launched on Spaceflight Industry's SSO-A multi-satellite launch on a Falcon-9 v1.2 (Block 5) rocket.